Nose radius suitable for fillet milling, also tangential form radius fit composite blade surface machining. Compared with ball nose end mill, an tangential form radius is larger and cusp height is controllable. This design makes highly efficient machining with larger pick feed. 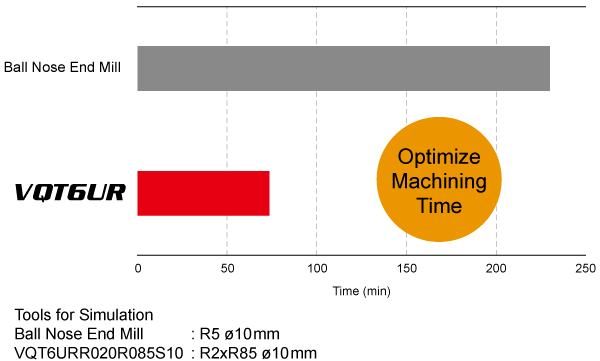 Shorter cutting distance contribute to longer tool life. Provided good surface finishes and there was no chipping on the cutting edge. High efficiency machining is possible while maintaining quality of machined surface.